Don’t listen to Viet Cong when you’re in a good mood. Happiness has no place within this band’s world. There’s plenty of existentialism, darkness, depression and punishment to go around though, if you’re interested. But that’s pretty much what you’ll get from any artists affixed with the genre label of post-punk. Just look at Joy Division, the go-to post-punk reference, who made it their mission to tell everyone that love will tear us apart. Actually Viet Cong and Joy Division share more than just some sonic similarities to one another. Their names both reference controversial armies/regiments from past wars responsible for plenty of death and destruction. That’s even resulted in at least one Viet Cong show being cancelled specifically because of their name. But they continue to soldier on, because what else are they going to do? What really matters in the end is the music itself, and at the very least in that aspect Viet Cong’s self-titled debut album is a real killer. What makes Viet Cong such a great and worthwhile record can really be whittled down to a single word: passion. It’s a quality that echoes through every single track, as the band plays with such urgency and hunger that you can’t help but be sucked into their vortex. The creative and unique twist they put on the post-punk label is equally exciting, particularly since so many other artists are simply content to do their best modern interpretation of The Jesus & Mary Chain or Sonic Youth. 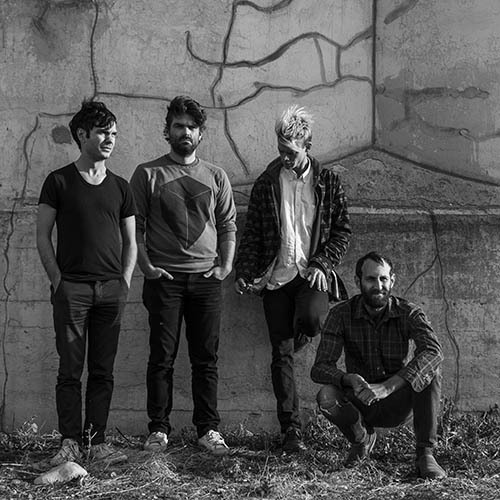 You can hear Viet Cong hit those touchstones with dashes of bands like Guided By Voices (“Continental Shelf”) and Wolf Parade (“Silhouettes”) as well, but then quickly swerve in obtuse and unexpected directions to keep you on your toes. While such experimental shifts can effectively alienate most listeners who thrive on the safe and familiar, the songs do their part to actively engage rather than shut anyone out. It’s how they can turn an 11-minute song called “Death” into one of the heaviest and most white-knuckle rides of 2015 so far. Actually, calling the entire album a ride is another great way to describe it. Though the lyrics tend to be less than upbeat and the melodies won’t make you recall a bright, sunny day, this is a really fun and darkly humorous (on occasion) collection of songs. In the middle of “March of Progress” for example, vocalist Matt Flegel brings a serious amount of veiled sarcasm and dry wit to lines like, “Your reputation is preceding you/ We’re all sufficiently impressed/ And this incessant march of progress/ Can guarantee our sure success.” It’s a sly eye roll, scoffing at the idea that artists need to go out of their way to kowtow to critics and crowds in order to get ahead. Such matters aren’t of concern to Viet Cong, and their refusal to compromise or adjust their art for the sake of acclaim and popularity seems to have yielded them healthy portions of both. As breathlessly exhilarating as the seven tracks of Viet Cong can be, it’s also important to note they’re equally fraught with conflict and a severe lack of any real human emotion. Flegel sings in a commanding monotone best compared to Interpol’s Paul Banks, and when combined with the highly distorted guitars as well as Mike Wallace’s overtly mechanical yet punishing drumming, it can register as very cold and clinical in its approach. Of course such a glassy-eyed approach has roots in post-punk and industrial music in the first place, so it makes sense for Viet Cong to fall in line there. They also avoid any hot button topics such as love or politics in their songs, favoring obtuse and wordy metaphors over clarity and relatability. These are the prices paid to thrive on experimentation and unpredictability. The band places form and function above all else, and such tinkering pays off with perhaps the first truly original record this year.